First, let’s start with some basic terminology. It is not uncommon for the terms “gearbox”, “drive” and “speed reducer” to be used interchangeably. A gearbox is any device that uses a gear train to transmit torque/rpm and anything that uses a gear to transmit torque/rpm is a gearbox. A right-angle drive is a mechanism with a gear train that can transmit torque/rpm 90 degrees, to turn a corner. A gear reducer is a mechanism with a gear train that can reduce rpm output. A result of decreasing rpm is increasing torque at the same ratio speed is reduced. The type of gear used in the gear box defines it as a right angle or an inline drive. So, what is a right-angle gearbox? A right-angle gearbox is a gearbox with a right-angle change in the direction of the shaft. It can be a 1 to 1 ratio or a multiple of 1 such as 2:1 or 15:1. If the ratio is 1:1 it is a right-angle drive. If the ratio is greater than 1:1 it is a right-angle speed reducer. If you’re curious about how a speed reducer works, check out this article that breaks down the mechanics of it in simple terms. 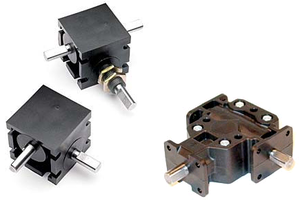 How do you select the right gearbox for your application? From choosing a manufacturer vs. a distributor to right angle gearboxes vs. standard speed reducers, the process of finding and ordering the perfect gearbox for your application can be daunting. We’ve created a guide, the How to Select a Gearbox Supplier Guide, that can help you with this process. In the guide, we explain how to set quality standards and determine product specifications. We also dive into what exactly goes into the price of a gearbox and what you can reasonably expect your lead time to be. We also walk through the specifics of how the design, quoting, and testing processes work. This post was published on August 31, 2017 and updated on April 12, 2019.